In 1980 Jim Donaldson’s son Michael took up racing pigeons. After a short time Jim took over these birds and has achieved amazing results. Scottish National Flying Club 27 times. one pigeon flew the channel 5 times - twice flying 620 miles and 3 times 707 miles. Jim together with his wife Ann make a brilliant partnership. With only a small team of birds to fly, their results are outstanding. In the last few years Jim has started a second small loft to fly the roundabout system which again has been very successful. North of Scotland Federation: Old, Young Bird and combined averages. SNFC: Ypres 180th Open 3rd Section 498 miles. SNFC: Young Birds Buckingham 383 miles - only 9 birds in Jim’s section and 4 of these were timed in by Jim. 1st Section 131st Open + 2nd Section 170th Open. 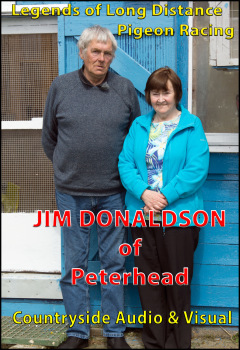 The success that Jim and Ann have achieved over the last 37 years makes them one of Scotland's greatest flyers at the distance.